In March 2016, Sarah Rafael Garcia had returned to her childhood city, Santa Ana, CA., as an artist-in-residence at CSUF Grand Central Art Center (GCAC). Prior to her return, Santa Ana’s only bookstore had closed. Her nostalgia and desire to reclaim a space in her community for culturally relevant literature would soon lead her to create a unique platform—a space for books by writers of color, bilingual and Spanish books for children, youth, and adults, as well as books about culture and social justice issues. When Sarah first received a planter cart meant to garden herbs and organic veggies from her friend, the only thing Sarah could envision was a bookmobile on 4th St.—a type of paletero cart that had books instead. And so, with the support from community organizations such as Red Salmon Arts and Community Engagement, the LibroMobile project was born. The repurposed gardening cart became, through Sarah's will and creativity, an artistic and literary hub in Santa Ana. Since then, the LibroMobile project has grown substantially and now includes free visual exhibits, year-round creative workshops and live readings. As of January 2018, the bookmobile resides in a warehouse on Calle Cuatro (off 4th & Spurgeon, back alley area) and travels throughout Santa Ana, visiting a variety of community-based events. The gardening cart where Sarah originally stocked 60 books has now become a bookstore with approximately 1000 titles, ranging from handmade zines to popular authors, to small press bilingual publications. LibroMobile has also been named The Best Used Bookstore of 2018 by OC Weekly "for helping to nourish the minds of its residents". ​Currently, Sarah restocks several Little Free Libraries located at the Delhi Center, Heritage Museum of OC, and several apartments complexes. 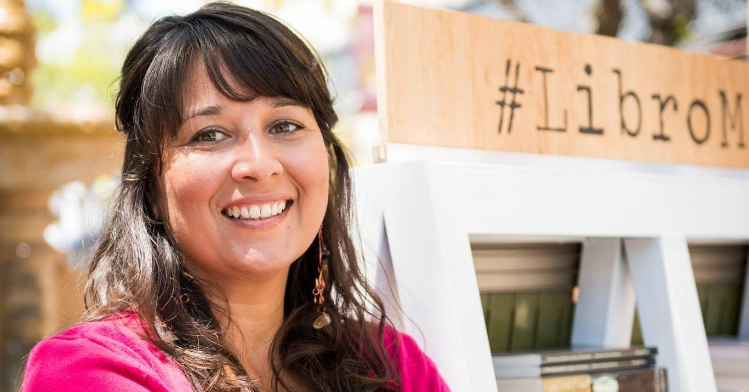 Through support from Community Engagement, she also donated little libraries to El Centro Cultural de Mexico, the public garden of Heritage Museum of OC, GCAC and others. LibroMobile also sells art by local artists where 100% of the profits are paid directly to the artists. LibroMobile is a safe haven for book-lovers, artists, and wanderers—a bold and growing initiative that builds community and literacy for the people of Santa Ana. Sarah Rafael García is a writer, traveler, and arts educator. Since publishing Las Niñas (Floricanto Press 2008), she founded Barrio Writers, LibroMobile and Crear Studio. In 2016, García was awarded for SanTana’s Fairy Tales (Raspa Magazine 2017), supported in part by The Andy Warhol Foundation for the Visual Arts, through an Artist-in-Residence initiative at Grand Central Art Center. Sarah Rafael is an editor for the Barrio Writers and pariahs writing from outside the margins anthologies. In 2018, she held a collaborative artist residency at The Guesthouse, Cork, Ireland and was honored as an Emerging Artist at the 19th Annual Orange County Arts Awards. Currently, Sarah Rafael García spends her days stacking books, providing art workshops and writing in Santa Ana, California. For more information about LibroMobile, visit their instagram page.